I guess when you have the opportunity to add a crazy-eyed, mustachioed clairvoyant to your film, you take it. 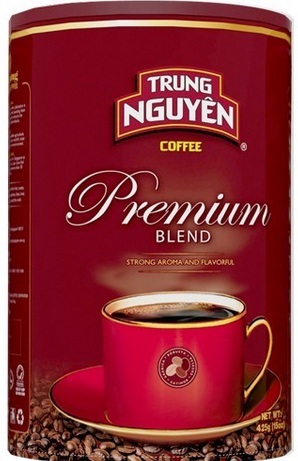 Whaaaa! Jack the Ripper POV shot! 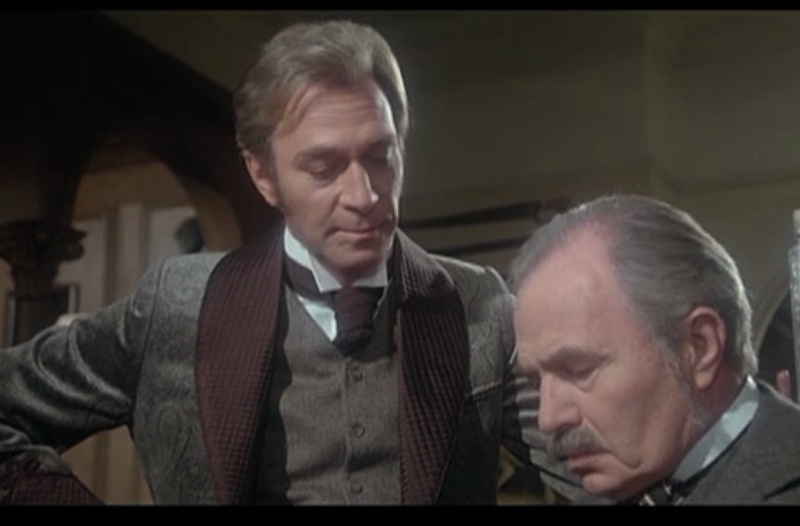 Christopher Plummer and James Mason are good actors, but they are both miscast here and this changes the Holmes/Watson dynamic greatly. 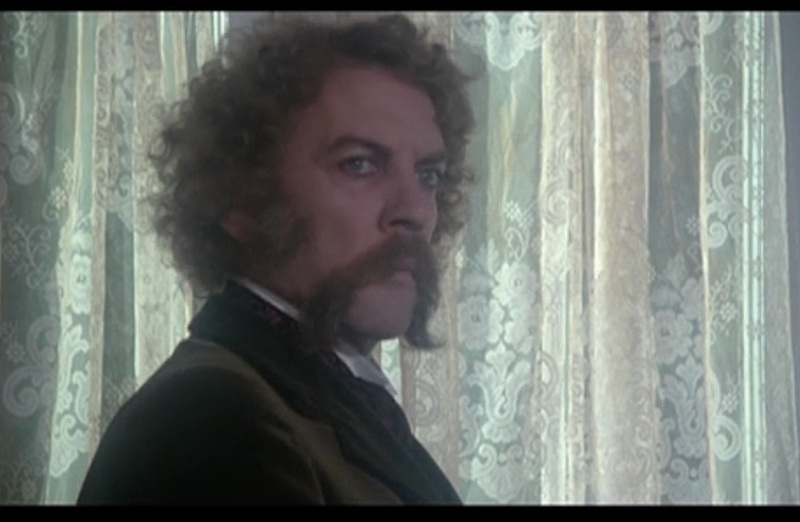 Plummer plays the most warm and empathetic Holmes I’ve yet seen. His smiles and sentimental expressions are just too much. In my review of Jeremy Brett’s work last year, I remarked that Brett captures the warmth of friendship that Holmes feels towards Watson. It is a side of Holmes we do not see a whole lot in the text, though, and often adaptations will err on the side of omitting it altogether. 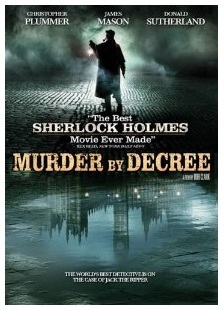 Where the Brett/Granada Holmes does well, Murder by Decree goes too far the other way. However, the warm and friendly Holmes would not have been as much of a problem for me if there wasn’t such a great age difference between Plummer and Mason, who is the oldest-looking-in-relation-to-Holmes Watson I’ve yet seen. But even this might not have been a problem if the script and direction were better, but they weren’t, so Watson comes across as a doddering old man, and Holmes as his doting care-giver. 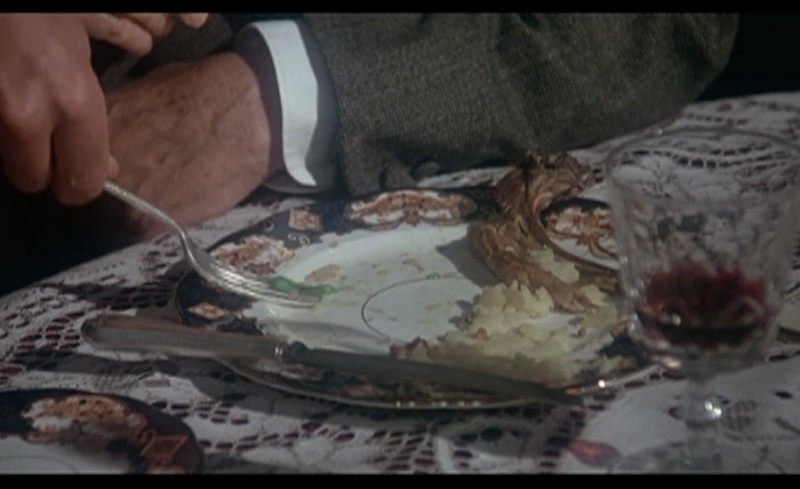 The scene opens at 221b Baker St. Holmes is trying to summarize the case so far, but Watson is noisily using a fork to try and stab the solitary pea left on his dinner plate. He keeps missing. Holmes asks Watson what on Earth he’s doing. Watson tells him … more dialogue … clank clank clank. I guess this was supposed to be amusing, and the dialogue tried to turn it into a clever metaphor, but the scene really just comes across as an old man being humored. I half expected a Nurse Hudson to walk in with Watson’s medication and a bowl of pudding. (No, it’s not lost on me that I, like this film, have now spent an inordinate amount of time on this scene). Murder by Decree is a film very much of its time, which means lots of slow motion (and even some bright red blood). There are several shots of an ominous black carriage making its way around London, very, very slowly. The dialogue is quiet, the sound effects aren’t very good, and the camera is stuck in a permanent soft-focus. 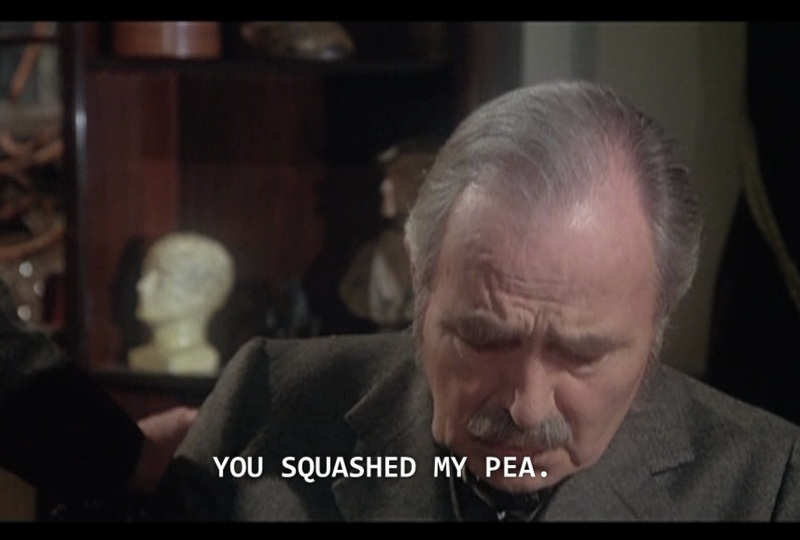 The Bottom Line: Huggable Holmes, James Mason being James Mason, and a silly conspiracy theory. I got bored and couldn’t make it through a second viewing.